The only thing Robotic American Football and real American football have in common is risk of injury. When my brother and I were young we used to get on opposite sides of the kitchen and slam our matchbox cars into high-speed, head-on collisions. Our mom didn’t think it made much sense. Which is the same feeling I get as I watch these Japanese robots “play” American Football by flying pell-mell into each other in a crash ‘em up frenzy. 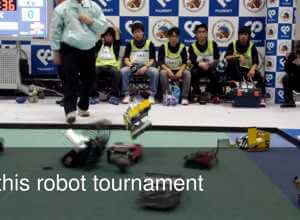 The robots play with a miniature football and the object is to carry the ball in a trap on top of the robot and get it across a goal line. I don’t expect that happens very often. Just as Americans love their sport, the organizers of Robot American Football in Yokohama, Japan take their game seriously and have created a detailed list of rules, but I really can’t tell if the robots are following them or not. Whereas RoboCup does well to emulate soccer, Robot American Football looks more like a cross between a crash derby and air hockey. But if this 7th annual tournament drives robotics developers to create better solutions to achieve a task, no matter the task it sounds like a score to me.